Find the best deals on the Samsung Galaxy S10 E with the Tiger Mobiles phone comparison tool. This affordable flagship from one of the world’s top mobile manufacturers has everything. Huge screen, tons of power, great cameras, and plenty of special features to boot. All for a cheaper than expected price. Could this be your new phone? Just check out our awesome deals on the Galaxy S10 E below. Samsung are one of the most recognizable names on the mobile market, and their best selling Galaxy S series regularly contends for the phone of the year. But this year, Samsung has released 3 separate iterations of the S10. The S10 E is the smallest of the three and is designed as a budget flagship, meaning it gets lots of features but is more affordable. Apple scored big with its budget SE iPhones, but is the world ready for a budget Galaxy? Samsung certainly thinks so, and who are we to disagree? Why should you want the S10 E? Well, there’s tons of power, and a fantastic screen, as you’d expect from Samsung. There’s a solid camera set, and some nice little extras as well. Yes, you’re going to have to make a couple of compromises when compared to the more expensive regular S10, but the price tag on the S10 E could make those sacrifices worth making. The S10 E looks very familiar. It has the traditional rounded corners and sleek edges that all Galaxy phones have. That glass and aluminium build means that the S10 E is lightweight, but feels solid and premium in the hand. There’s no screen notch here, though you’ll see a black dot in the top right corner housing the front camera. On the whole, the S10 E looks like every other Galaxy, and that’s no bad thing, it’s a sophisticated, fine looking phone. Looks aside you’re getting some solid internals as well. There’s plenty of power and RAM, you get fantastic screen specs and solid cameras, as well as a few extra features. Package all of this together and you’re looking at a mobile that is fast, good looking, and affordable as well, so the S10 E is definitely ticking boxes. Though the S10 E is designated as a budget flagship it’s not going to compete against the regular S10, or the newest iPhone. However, it will perform magnificently, do anything you need it to do, and it won’t break the bank. You’re getting some top end specs here, and at this price point complaining about anything else would be petty. Performance is the number one thing that we look for in a phone, and the S10 E delivers in spades. You’re getting massive octo core processing (made up of a quad core 1.95 GHz processor, plus a dual core 2.31 GHz, and a dual core 2.73 GHz) along with a full 6 GB of RAM. That means that speeds are really top of the line, and the S10 E is extremely responsive even when multi tasking. Being a Samsung this is obviously an Android device. You’re getting the newest Android 9.0 Pie out of the box. That gives you the added stability of a new operating system version, plus some neat new features. There’s a new rounded look to the OS, as well as a new gesture navigation system, and plenty of speed tweaks under the hood. Long story short, performance should never be an issue with the S10 E. Sure, you’re not getting the top end specs of the regular S10, but as a normal user you won’t notice any difference, and you’re really not making any performance sacrifices for that lower price. Fast and responsive, what more could you ask for? Probably the most noticeable difference in the S10 E vs. the regular S10 is screen size. The S10 E comes with a smaller display, though that 5.8 inch screen is still more than big enough for comfortable viewing and typing. And the S10 E is big enough that one handed use could be a problem. When it comes to resolution you’re looking at 1080 x 2280, so Full HD, giving you around 438 PPI. And given that this is a Samsung device, you’re getting a Dynamic AMOLED display as well. All this results in a clear, sharp picture with excellent colour reproduction and superb viewing angles as well. Yes, you’re making compromises when it comes to size, but that’s it. The S10 E’s display is beautiful, rich, and a pleasure to look at, particularly for HD video. Samsung tend to have excellent cameras, and the S10 E is no exception to that rule. Starting at the front you’re getting a 10 MP cam (f/1.9, 26 mm), which is more than good enough for selfies and video calls. Move around to the back and you’ll find another small compromise: the S10 E doesn’t have the triple lens rear cam featured on the regular S10. It does, however, have an excellent dual lens rear camera (one 12 MP, f/1.5-2.4, 26 mm lens, and one 16 MP, f/2.2, 12 mm lens). You get LED flash, auto HDR, and all the other bells and whistles that you’d expect to see on a top end camera set as well. The S10 E takes excellent pictures, it’s that simple. No, you don’t get a triple lens camera, but you do get a fantastic dual lens cam, and for most of us that should be more than enough. Photos from the S10 are bright, clear, and get great colour reproduction, so you’ll hear no complaints from us here. Despite it’s budget statue, the S10 E is a flagship phone, and so it gets plenty of extra features. There are a few that deserve special mention though. Firstly, this is an IP 68 rated mobile, meaning it’s dustproof and waterproof in up to 1.5 metres of water for up to 30 minutes, always handy if you’re a little accident prone. Battery life is good too, with a 3100 mAh battery on board that Samsung say should last a full 24 hours (though your results may vary depending on your phone usage). You do get fast charge tech, as well as wireless charging should you want it. The S10 E does NOT feature the under-screen fingerprint sensor seen on the regular S10, though you do get a side mounted fingerprint sensor for security. You also get a headphone jack, which could be a selling point for some. The Galaxy S10 E comes in a myriad of colour versions, including blue, black, pink, yellow, and green, so there’s no shortage of choice. The basic version comes with 128 GB of internal storage (along with a microSD slot for up to 512 GB of extra storage) and 6 GB of RAM. There is also a 256 GB version with 8 GB of RAM, though as yet we’re not sure whether this will be sold in the UK or not. So, let’s talk money. This is a Samsung Galaxy, which means you’ll be able to find it at pretty much any operator that you like. If you’re going SIM free, then the S10 E is going to cost you around £669, which is a steal when compared to the regular S10. On contract, you’re looking at anywhere from around £35 a month plus £99 up front. Since this is a high end phone, you should be looking for contracts with big data packages, and do make sure that you’re getting 4G included as well. You might be able to get away with smaller data limits if you’re constantly on WiFi. And keep an eye out for extras, since many operators are offering gifts such as Samsung wireless earbuds with S10 E contracts. Because the S10 E is a new flagship model you’re unlikely to find any discounts, whether you’re looking at SIM free or contracts. Generally, Galaxy phones don’t discount in price until just before the release of the next model, meaning you’ll likely not find cheaper prices until around the beginning of 2020. If you’re looking for something a bit more affordable, then it’s worth checking out the Galaxy S9 range as a cheaper alternative. 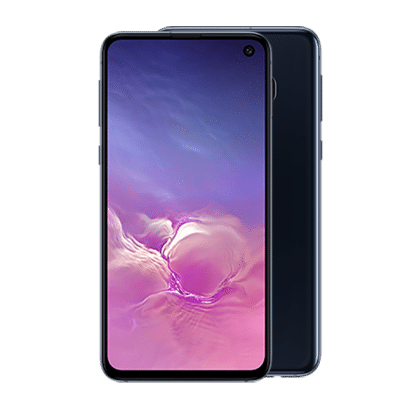 If you want a phone that gets top end performance but that doesn’t cost the earth, then the Samsung Galaxy S10 E is going to be an awesome choice. Loads of power, a fantastic display, great cameras, and a lower than average price tag all make the S10 E a great option for even the more demanding shopper. Budget flagships are a fairly new niche and one that we’re glad to see. And the Samsung Galaxy S10 E is the perfect specimen. Lots of power, great specs, and a very affordable price tag for a flagship phone. We particularly love that bright screen, and the cameras aren’t to sneeze at either. If you’re looking for a great phone that has loads of features but doesn’t cost the earth, then you’re going to love the S10 E just as much as we do.